Let me start my first post in 2010 with a sweet dish. Badam Kheer is a delicious Indian dessert prepared with almonds. If this kheer is prepared in the manner as I have mentioned below, it can be stored even for 2-3 days in the refrigerator. If you are planning for some party, you can prepare this in advance and refrigerate it. Badam kheer can be served either hot or cold though tastes awesome when cold. It is very simple to prepare but tastes royal. Today we will learn how to make Badam Kheer/ Almond Kheer following this easy recipe. Kesari colour - a pinch (optional)- mix it with a tsp of milk. Soak almonds and cashew nuts in warm water for 2 hours. Take 4 1/2 cups of milk and simmer it till it reduces to 2 1/2 cups. Peel the skin of almonds and grind it with a little milk along with cashew nuts to a coarse paste. Mix this paste with the remaining 1 1/2 cups of milk and cook till the raw flavour goes. Now mix both the milk together, add sugar and simmer till sugar dissolves. Remove from flame. Add cardamom powder, saffron and kesari powder. Fry chironji in a tsp of ghee and add to the Kheer to give a rich and royal taste. 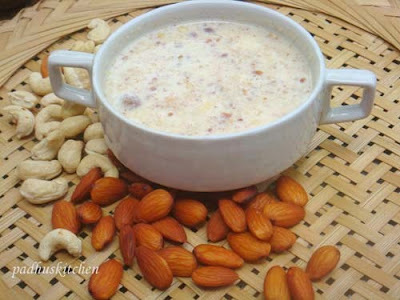 Celebrate your New Year with this yummy and rich Badam/almond kheer. Lovely kheer. Thanks for the entry. Healthy and yummy kheer! !..tempting pics!! Yummy rich kheer. Beautiful way to begin the New Year. Wow what a great way of welcoming new year. it couldnt have been better PAdhu. kheer looks delish! hey this kheer luks very rich n yummy...its perfect for this season. Delicious kheer..Happy New year Padhu !!!!! This sounds so good. I have never had it before so I have to try it. wow..lovely kheer..padhu...my new year wishes to u and ur family. It is a nut called charoli in Hindi and saara paruppu in tamil. sorry to ask...but did u change the pic of this almond kheer...i was searching or a yellow colour badam kheer recipe in you blog which i found quite some time back...but can't find it now..is this the same ? Flourista- No, I did not change the picture though I have plans to change the picture. I think you are mentioning about my carrot kheer which is yellow in color. You will find that under kheer or payasam recipes or Indian sweets. Hi madam . I tried badam kheer recipe today it tastes good but I 've a doubt how it's consistency should be? Hello. Thank you for this recipe. I, too, have a question about what the final consistency should be-- mine came out liquid like still, so tasted more like badsm milk than kheer. Any tips? Thank you! You must use full fat milk for it to be rich and creamy.Also you have to reduce the milk. Adding it gives a nice flavor. Hi, this is a question related to general health and not this recipe in particular. I couldn't find an appropriate place to post it hence posting here. Since your healthy lifestyle is reflected in your blog I felt you are a person capable of clearing my doubt. What is the best way to eat almonds to gain Maximum nutrients? Should the peel be removed after soaking or not? I personally soak it overnight, change the water once or twice, peel off the skin in the morning and eat it. I also grind it with dates and use it instead of sugar to sweeten my milk and smoothies. The best way is to soak overnight, peel the skin of almonds before eating. I prefer using fresh milk. May be you can try evaporated milk.